Concept of thinking and decision making. The guy is looking for an answer to a question or a solution to the problem. Aged pensive man, portrait. Elderly man thinking about current problems on blurred background. In searching of right solution. Young thinking woman on blurred background. Young worried woman is thinking. In searching of right solution. 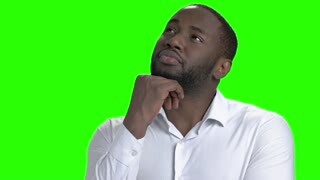 Confused afro-american guy on green screen. 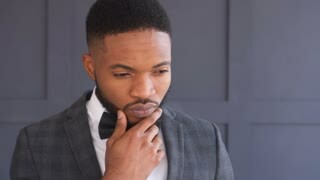 Thinking dark-skinned businessman on Alpha Channel background.